It brings me back to my childhood. Most little kids had moms who regularly made them sandwiches for lunch. I mean, I didn’t even know it was possible to eat something besides sandwiches for lunch until I was in middle school and discovered leftover pizza (I was really a picture of health, haha). But for some reason this one image sticks out in my head, of my mom leaning into the back of our old brown Caravan, wide brimmed hat protecting her from the harsh beach sun, wrapping up sandwiches in paper towels to protect from from the sand. I don’t think the paper towels helped much, but that special mom touch made the sandwiches seem so wholesome, like a gourmet meal, even though they were nothing more than slices of meat and cheese with a little bit of mayo. For Christmas this past year, my husband got me a vegetarian sandwich book. I’m pretty sure his excitement over the possibilities in the book came from a sandwich I had already made him: grilled eggplant and tomato with a peppery mayo sauce on focaccia. Now that it’s summer again, it’s time to indulge in ripe tomatoes and deep purple eggplants and enjoy this sandwich at its best! So, I did make my own focaccia for this sandwich, and in case you are curious, I used the recipe from Rose Levy Berenbaum’s Bread Bible, but substituted whole wheat flour for half. Honestly, I wouldn’t recommend this bread…it was rather dry in the center, but oily on the top. Not the best combination. I’ve been searching desperately for the perfect focaccia recipe, so far to no avail, so if anyone has any suggestions, I would love to hear them! This sandwich is delicious, but a bit messy. Happily, it takes only about 10 minutes to make, and you are likely to have most of the ingredients on hand! Start by cutting 2 tomatoes (I prefer large roma or plum tomatoes) in half lengthwise. 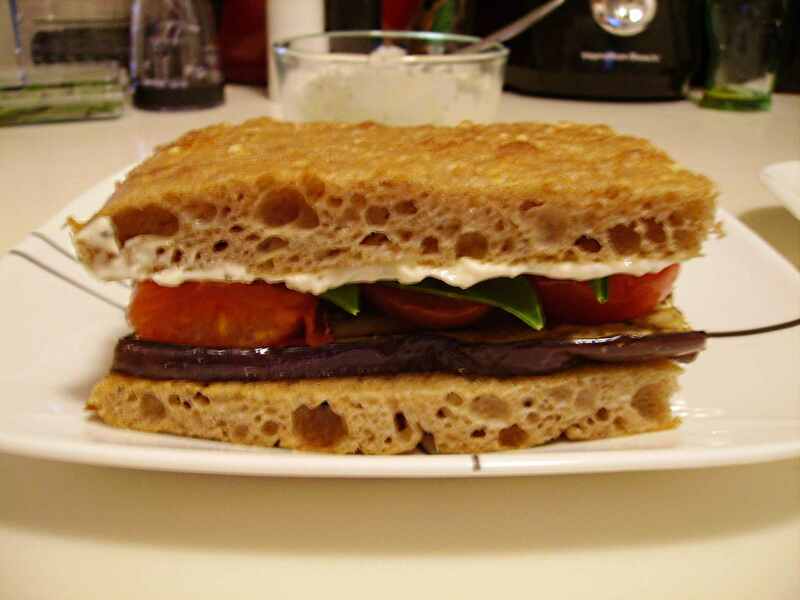 Slice an eggplant lengthwise into 4 ½″-thick strips. Lightly oil both sides of the vegetables and set them onto a George Foreman grill. For a shorter cooking time, close the lid, though be warned that the tomatoes are fatter than the eggplant, and thus the eggplant might still need to be turned to grill on both sides. Meanwhile, stir together mayonnaise, fresh lemon juice, parmesan, and pepper. Check the vegetables. They should be very soft and have grill marks on the tops. Transfer to a plate to cool slightly and release some of the juices. Assemble the sandwiches: layer a slice of focaccia with eggplant and tomatoes. Top with lots of fresh basil. Spread the top slice of bread with the peppery mayo sauce and place atop the vegetables. Make sure you keep several napkins close by, as the tomatoes will be juicy. 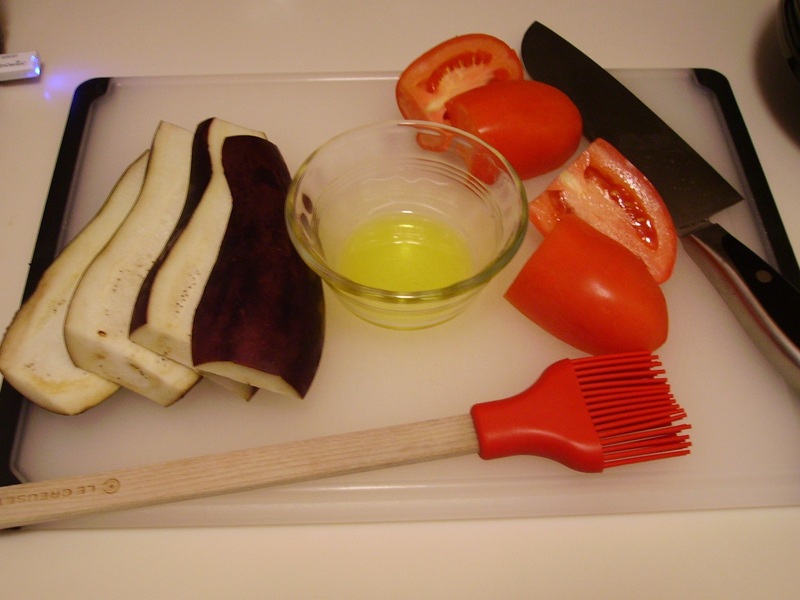 Brush eggplant slices and sliced tomatoes on both sides with olive oil. Season, if desired, with salt and black pepper. 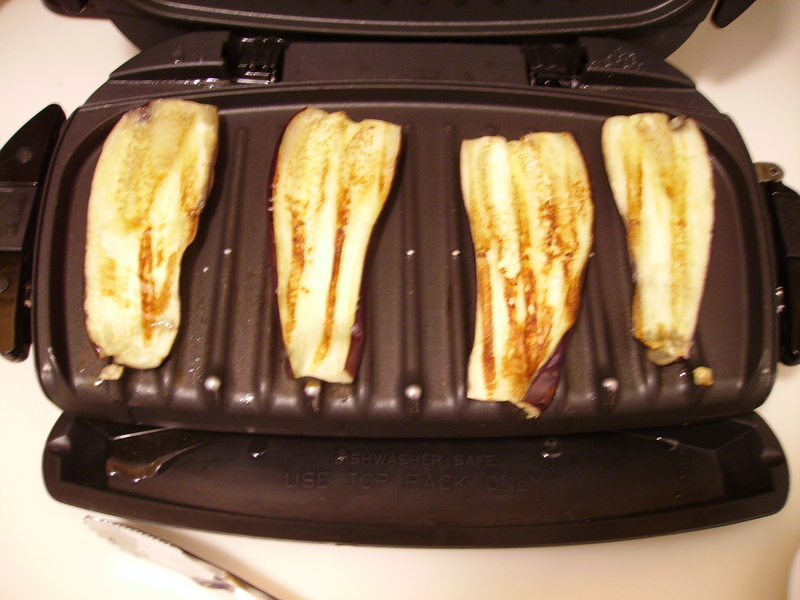 Grill on a George Foreman for 4–6 minutes, or until tender and slightly charred. Meanwhile, stir together mayonnaise, parmesan, lemon juice, and pepper. Refrigerate until ready to use. 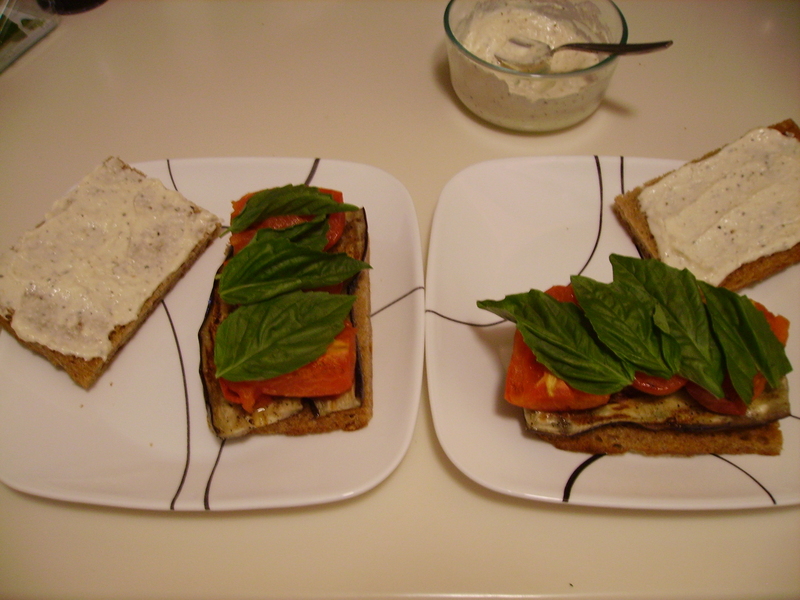 Layer bottom slices of bread with grilled vegetables and basil. Evenly spread top slices of bread with the sauce and set atop the vegetables. *Note: This recipe can easily be doubled to serve more people. Grill the tomatoes first and then the eggplant slices.